What Does the Susan G. Komen Foundation Actually Do? 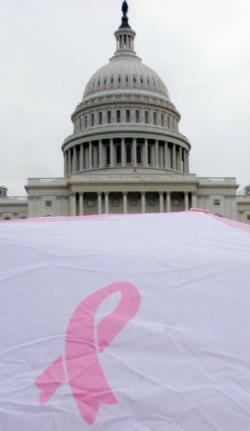 Washington, UNITED STATES: The pink ribbon, symbolic of breast cancer support, is seen during the Komen Community Challenge rally 26 April, 2007 on Capitol Hill in Washington, DC. In the wake of last week’s dust-up over the Komen Foundation’s short-lived decision to cut its funding ties with Planned Parenthood, many of us at Double X started to wonder just what the pink-ribbon organization actually does with all the money it collects. After all, though Planned Parenthood was at risk of losing about $700,000 in grants, that’s a pittance compared to Komen’s impressive income of about $400 million dollars in 2010. Where does all the rest of that cash go, and, more importantly, is it really being put to the best possible use? I took some time to go through both Komen’s tax filings for 2009 as well as its Annual Report for 2009-10 (PDF), and the breakdown of expenditures goes like this: 12 percent for administration; 8 percent for fundraising; 7 percent for treatment; 15 percent for screening; 24 percent research; and 34 percent for education. Putting the administrative costs aside for the moment, let’s break down what each of the remaining categories actually means. While Komen understandably touts cases in which its funds have directly subsidized individuals’ cancer treatment, such intervention only accounted for about $20 million in 2010. In terms of individual patient care, far more money goes to screening (including Planned Parenthood), which include mammograms and general clinical exams; Komen claims to have funded 625,000 of these at a cost of a little under $50 million in 2010. On the research front, the foundation provides grants totaling about $75 million to both individual researchers and organizations with specific research projects, such as a study about the efficacy of flax seed as a cancer prevention measure. Finally, Komen dropped just over $140 million on breast cancer awareness education, which they say reached 2.2 million people in 2010. In our internal discussions, that last number—the remarkable amount of money spent on education relative to the other services—roused the most suspicion. Emily Yoffe wondered if such an intense focus on awareness was misplaced: “When Komen started 30 years ago part of its mission was ‘breast cancer awareness.’ They’ve won that war. Who’s not aware of breast cancer?” And indeed, the use of “awareness” as a somewhat murky concept in the health-focused nonprofit world has come under some scrutiny as of late. How can one tell when the target audience is sufficiently saturated with awareness, and how do you measure that on an individual basis? When do awareness campaigns cross the line between honest education and organizational self-promotion? These are not unfair questions to ask given Komen’s near-monopoly of the breast cancer advocacy stage, a status that has been controversially maintained by a rather aggressive legal policy against other charities who want to use the phrase “for the cure” in their materials. (According their tax filings for 2009, Komen spent about $375,000 on external legal services in addition to rewarding their then general counsel, Jonathan Blum, with a total compensation package of just under $218,000.) Beyond the issue of education, the actual medical usefulness of all those mammograms—for which Komen advocates fiercely—is also worth considering. Recent studies have shown that the tests don’t actually reduce the risk of death from breast cancer by all that much, and, in some cases, the exaggeration of their relevance actually leads women to have unnecessary and invasive procedures.